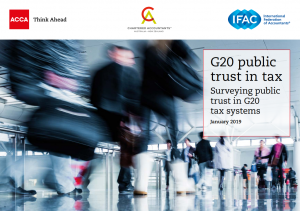 A new report on G20 public trust in tax, published by ACCA, CA ANZ and IFAC as a sequel to the report launched in 2017 under the same title, reveals a high level of distrust among the public in politicians and NGOs when it comes to tax systems – with respondents across G20 nations being most concerned about transparency, complexity, inequality and corruption in tax systems. On the other hand, the report shows that public trust in professionals, such as accountants and lawyers, remains high in comparison. For further information please access the related press release on the IFAC website.